The Museum of Australian Democracy is proud to announce it has purchased an artwork by Penny Byrne for the museum’s collection – Saint Kevin 07 and the real Julia (2010). The museum has a particular interest in collecting material relating to prime ministers, and this acquisition is part of a collection that includes caricatures and cartoons. Penny Byrne leads something of a double life. As a highly respected ceramics conservator, her ability to expertly conserve and repair high-end decorative arts is highly sought after by museums, galleries and collectors. 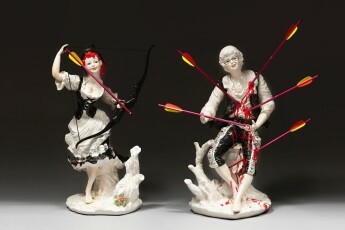 Since 2004, Byrne has also developed a firm reputation as an exciting contemporary artist, creating subversive and political artworks from reclaimed mass-produced porcelain figurines. Byrne uses objects familiar from our mantelpieces, china cabinets and toy boxes, to create a sense of nostalgia, drawing you in. This initial familiarity is cleverly subverted, transforming the porcelain into a powerful work of political commentary. Byrne’s artworks convey her concern, anger or amusement, and voice her views on social justice, the environment, war and politics. The work presented in the museum’s current exhibition Political Porcelain is a compelling illustration of the artist as activist. Of her artwork purchased by the museum, Byrne says “I wanted to make a work about the change of prime minister in 2010 and how the Labor Party conducted that change. It made me think about those powerful images of Saint Sebastian who was martyred by having arrows shot through him. I linked this with Kevin Rudd being martyred for the Labor Party’s efforts to stay in power.